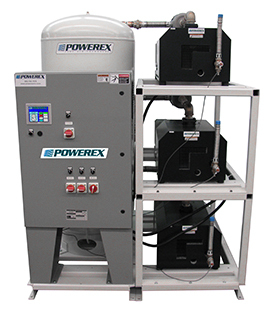 Powerex Medical Vacuum Products | Lewis Systems, Inc.
Powerex medical vacuum systems are fully compliant with the latest edition of NFPA99 and includes multiple vacuum pumps, ASME receiver, and control panel. Single point connections are provided for system intake, system exhaust and electrical. All interconnecting piping and wiring is included and operationally tested prior to shipment. Vibration isolation pads and flex connectors are included with the system. Powerex manufactures all systems in ISO9001 UL certified facilities to ensure the highest quality. Systems are available in three configuration types: Vertical tank mount, Modular skid mount, and Horizontal tank mount.